Thanks to the latest advancements in implant technologies, permanently replacing missing teeth has never been easier. At KR Dental, we work closely with Dr. Emad Hanna who specialises in dental implant treatment. As a result, you can be sure that your treatment is being provided by the most qualified team who are dedicated to your oral health and future function. 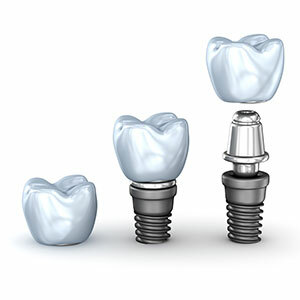 A dental implant is essentially a substitute for a natural tooth root which resembles a titanium screw. This then serves as an anchor to hold a replacement tooth (the crown) in place. Titanium (or titanium alloys) is the preferred material for implants, as it is able to maintain a close union with bone in order to support replacement teeth. Dental implants can be used to support a single crown, a bridge, or a denture depending on your needs. When cared for correctly, a patient can expect their dental implant to remain strong and secure for a lifetime. The dental implant process will begin with our dentist thoroughly assessing your mouth (including your jaw bone and the site of the missing tooth) to determine if you’re a suitable candidate for the procedure. It will also need to be determined whether you require a crown, bridge, or other restorative appliance. The implant surgery is then completed in two stages, beginning with the placement of the implant into your jaw. Our practice utilises effective pain management and sedation options, ensuring your surgery is as comfortable and pain-free as possible. The second stage of surgery occurs once the implant has successfully fused with the surrounding bone and soft tissues. This involves uncovering the implant, ready to permanently fix your crown, bridge, or other restorative appliance. Once your procedure is over, you’ll be left with a natural looking and feeling tooth that is extremely functional, strong, and long-lasting. Do you have a missing tooth (or teeth) that need replacing? Don’t put up with a lack of confidence or functionality any longer. Call the KR Dental team today to schedule your implant consultation!